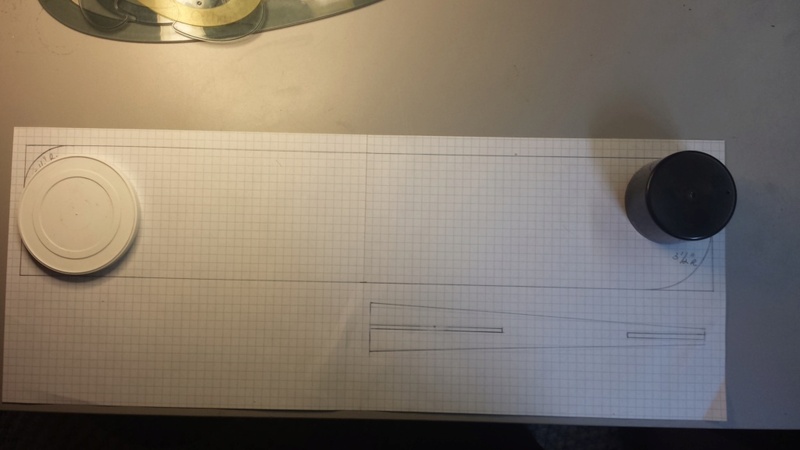 I've had the urge to design another simple 1/2A C/L sheet-wing/profile model for Cox .049 reed-valve power. My last few designs in this class have been smaller models (overall).. than most others, that I designed in my early years. I want to continue that "smaller trend". 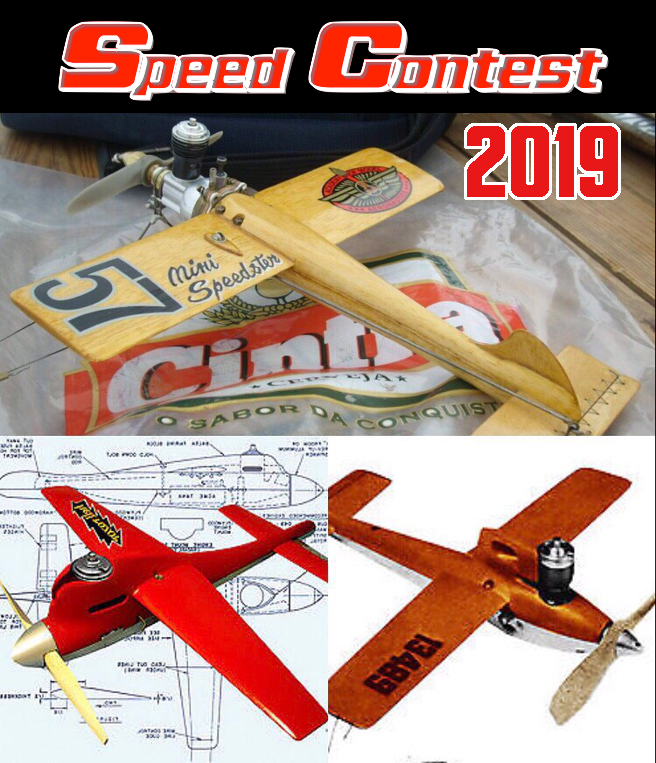 It started with the 1st CEF Speed Contest conceived in 2013.. when I scaled-down a Grumman F8F-2 to meet the contest criteria. That turned-out to be a fairly small model.. but it was heavy for its size. No big deal for a Speed-model. Next came the T33, P38 and tiny "Flying-Blind". Although finished; (for the most part..) none of those four have flown. None were built to be static-models.. I just really like the designing/building-aspect. 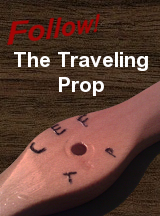 My designs usually balance close-to where they should when RTF. This next design will be a monoplane with futuristic lines.. some being an "illusion" created in the finishing-process. I'm envisioning something in the same class as the Goldberg "Stuntman 23" or Sig "Skyray".. but more modernized.. a tad smaller.. with a smaller 20-21" wingspan.. but a larger chord. The tail-moment may also be shorter than either of those two designs. I will create a B.O.M. and check stock on the materials before drawing-out some contours of components. The construction is a planned balsawood one.. with some hardwood/plywood components in key areas of construction. I'll post more progress as it happens.. but I plan on naming this design; "Fulcrum".. Sounds good, and like a neat looking model. Just trying to envision something here. NEW222 wrote: Sounds good, and like a neat looking model. Just trying to envision something here. I'll work-up some sketches.. and post a photo soon, when I come up with something I like. 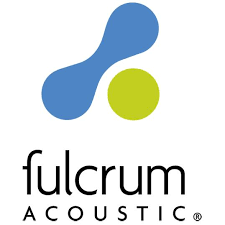 fulcrum Acoustic is the company that I've been working for since 3/18. We make speaker-enclosures.. and most are wood cabinets. Baltic-Birch plywood of 12, 15 and 18mm. construction. H/D audio.. cooool stuff; especially if you're a musician. I'm both a musician and hobbyist... so this model-project is a crosslink. I especially like the meaning of fulcrum; when applied to aeronautics/model-aeronautics. I'm hoping to echo that thought in my design. I haven't forgotten about this little project.. and that's precisely what it is; a "little" project.. which I'll try to keep simple. The "airframe" is leaning-toward a 1/2A U-control sport-model in the spirit of the Carl Goldberg models that were once offered in that class. 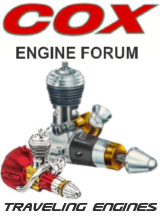 The planned-engine will be a Cox .049 reed-valve "Product" engine.. in that; the engine will utilize an external fuel-delivery. The airframe-construction will be lighter-weight than what I typically design.. but it will be a simple slab-wing type model. I've been reviewing construction-materials/methods.. and am settling on a lighter-weight design which may not "hold-up" to pilot-error.. but may "pay-off" with agility. Here's the profile fuse that I came up with tonight. It's 3/16" hard balsa. A symmetrical shape of 10" in length, 1.5" height at the nose.. and .500" at the tail. 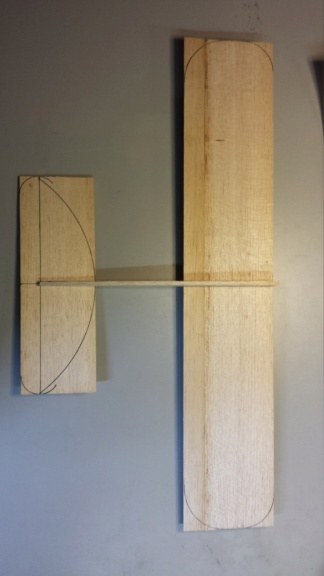 A .750" centerline for the 1/8" sheet-balsa wing and stab. cut-outs. Sometimes lighter weight pays off with less damage if an accidental impact occurs. 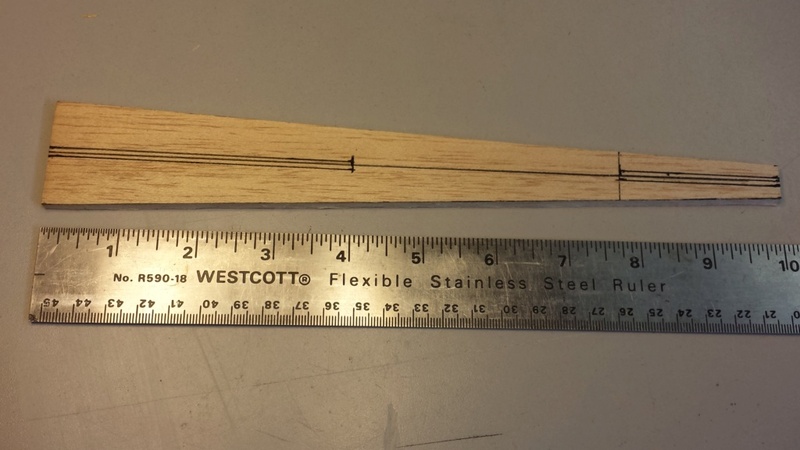 I'm considering a 1/8" balsa sheet-wing of 21" span with a root-chord of 4" for an approx. area of 80-84 sq. in. 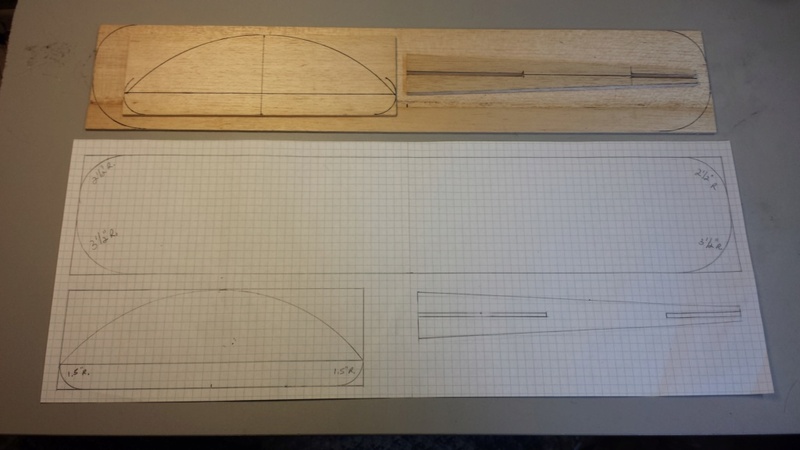 The stab-span is planned at 9".. with a root-chord of 2.25" for an approx. area of 19-20 sq. in. Looks nice and simple. You can also do whatever you like to teh wing or tail tips as well to make it 'yours'. NEW222 wrote: Looks nice and simple. You can also do whatever you like to the wing or tail tips as well to make it 'yours'. Hey Chancey.. I appreciate your attention to my efforts bro. and you "called-it" in regards to the design-work.. and making it "my own". As I stated earlier though.. With this model; I'm drawing some design-cues from the 1970's Goldberg 1/2A control-line models that were designed for the Cox reed-valve (Pee Wee .020, Babe Bee/Golden Bee .049) engines.. such as the "Swordsman 18" and the "Stuntman 23" balsawood-kit model-airplanes. Those were fun models that flew really good.. when compared to any of the Cox plastic RTF control-line models. 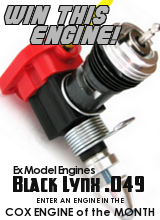 The exception "here" will be that this model will utilize a Cox .049 "Product-Engine" with an external fuel tank. That said; the dimensions for this airplane will be somewhere in-between the Goldberg "Swordsman 18" and the "Stuntman 23".. with its' slab-wing and stab. on the fuses' centerline.. (are you picturing it?) and the wing's L/E is right-up at the fuses' nose. It will have a landing-gear in a tail-dragger configuration with .062" music-wire inverted-"V" mains with a nice little pair of hardwood wheels on its' axles.. I'm getting a bit ahead of myself "here".. but I started to draw-out the design this afternoon. 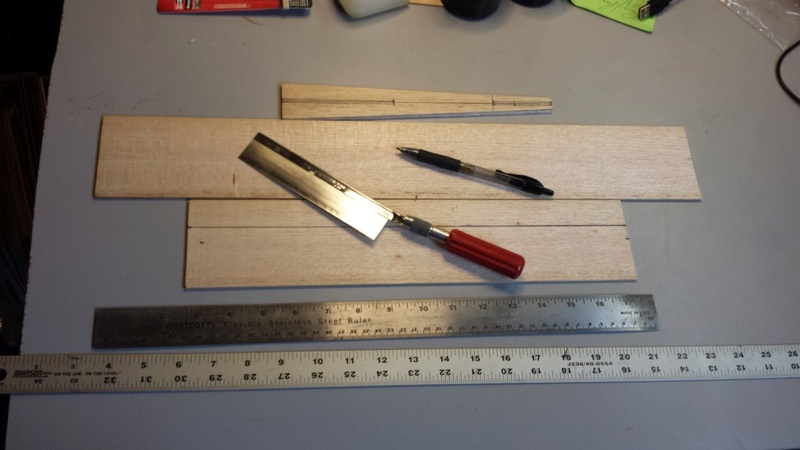 I used simple-round objects to make my wing-tip contours on the plan..
2.5"R. on the leading-edge and 3.5" on the trailing-edge..
My sheet-wing was made from 1/8" sheet balsa. The 4" chord was made-up from a 3"width sheet, with a 1" width sheet edge-glued to it using thick CA. I hang a box-fan behind me, running on low-speed for ventilation. 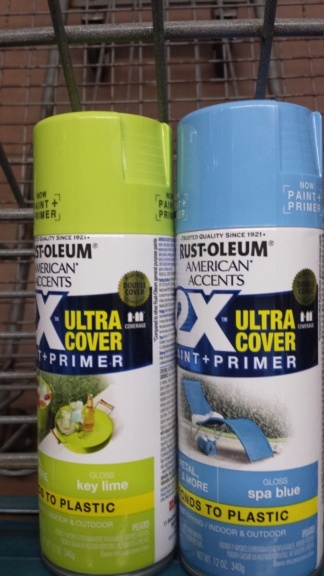 I have developed a respiratory allergy to cyanoacrylate (Super-Glue) adhesives.. so I take some precautions. 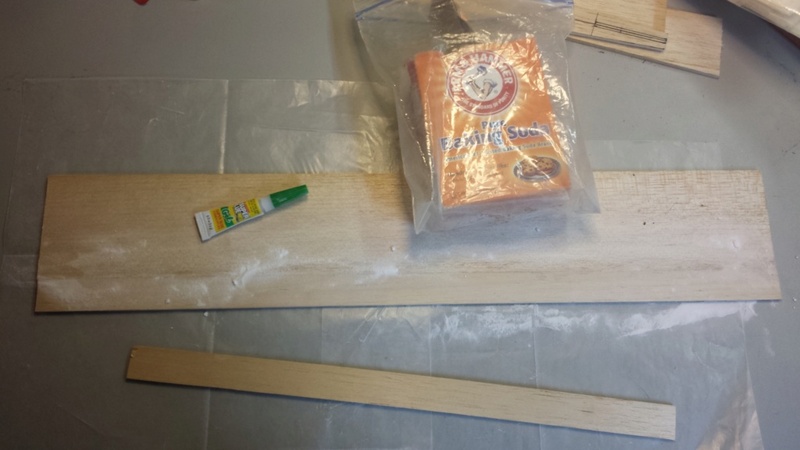 I lay-out wax-paper beneath the pieces to be joined.. and have bicarbonate of soda (baking-soda) handy, which works as an accelerator for the CA glue. 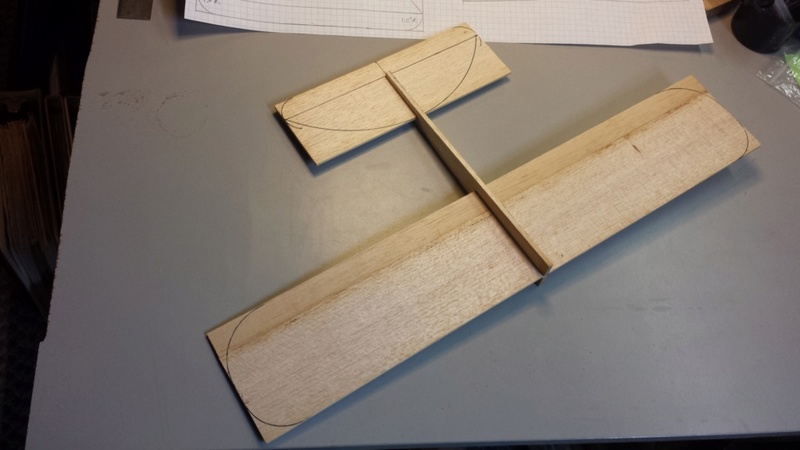 I will transfer my proposed radii markings to this wing-panel.. and then lay-out the stabilizer. More to come.. It is now getting that much closer to being a reality instead of a drawing now.... I like the french curves. A little while ago, about a year, some very knowledgable person here happend to suggest having a set was a good thing and I did heed their advice and picked myself up a set...... And glad I did as I actually used them a few times on little things. Anyways, nice to see it coming along. You build 'em roddie and I fix 'em. Both adventures are a lot of fun. NEW222 wrote: It is now getting that much closer to being a reality instead of a drawing now.... I like the french curves. A little while ago, about a year, some very knowledgable person here happend to suggest having a set was a good thing and I did heed their advice and picked myself up a set...... And glad I did as I actually used them a few times on little things. Anyways, nice to see it coming along. The French curves are a great designing tool.. aren't they"? I'm glad that you got them. Some people can draw beautiful flowing-lines "freehand".. but I'm not one of them..
rsv1cox wrote: You build 'em roddie and I fix 'em. Both adventures are a lot of fun. Yes Sir, Robert! The "flying" used to be an adventure too... and I will getback to it; come hell or high-water..
Yea.. I'm quoting you a "second-time" Chancey. Those French curves will be used when I design the final contours to the profile-fuse. The contours will likely be subtle.. but drawing a profile-canopy is a LOT easier with a French curve. You can also draw a nice "belly-pan" that may span from nose-to-tail using a narrow piece of scrap balsa if it's long-enough. That little extra contour; however slight.. can make a HUGE difference over a "boxy" straight-line. 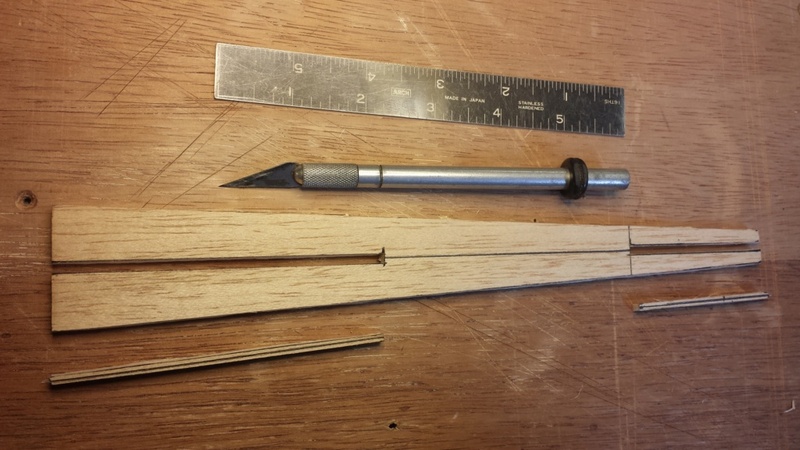 Slots cut for the 1/8" balsa sheet-wing and stab. The next step has traditionally been drawing the stab./elev. 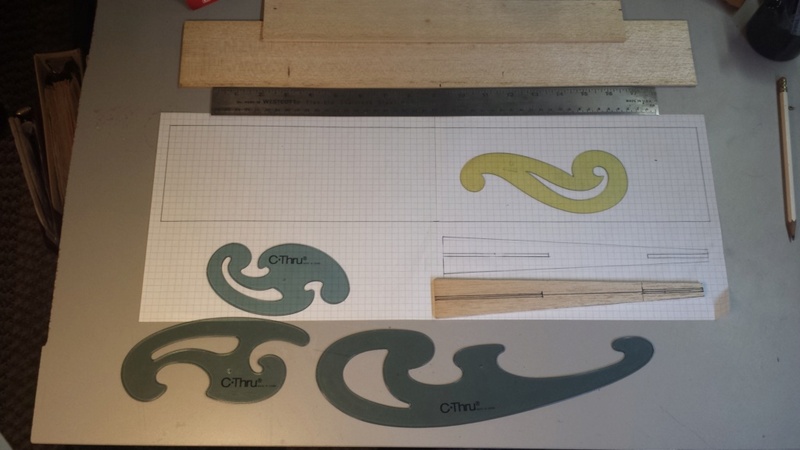 contours and laying-out the design on the wood. This is a "short-coupled" design.. (purposely) to satisfy my curiosity. Most of my latest aero-designs aren't.. with the exception of the F8F-2 Rare Bear that I designed/built for the 1st CEF Speed Contest. I was able to lay-out the stab. elev. contours before the start of President Trump's "State of the Union Address"! The elevs'. chord is .75" so I chose a 1.5" radius for its' tip-contour. The stabs.' chord is 2.25" and I wanted to give its' L/E a BIG curve... reminiscent of the Sterling Ringmaster. 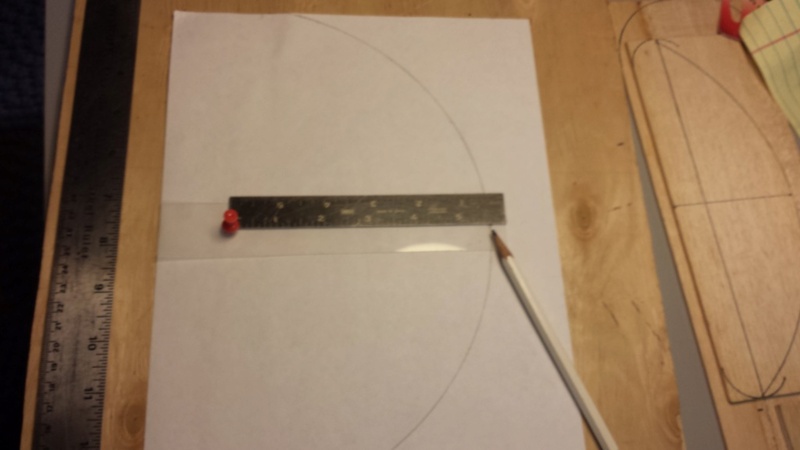 The assembly's span is 9" and I ended-up calculating a 11.25" radius, to arrive at a curve which intersected the three points which I needed it to. I made a simple fixture with a 5.125" arc to draw it. People with more mechanical-drawing experience could explain it better.. but I think most of you can understand what I did.. to get the results that I needed. I am really liking the outlines. The shapes are very unnatural to what I envisioned, and for that I like them even more. I think what I like most about them is the very roundness of the tail surfaces and the wingtips tied in with the squareness of the triangular fuselage. NEW222 wrote: I am really liking the outlines. The shapes are very unnatural to what I envisioned, and for that I like them even more. I think what I like most about them is the very roundness of the tail surfaces and the wingtips tied in with the squareness of the triangular fuselage. Thanks very much Chancey.. but keep in mind; I've been prototyping my fuses with straight lines initially lately. This fuse will have a canopy, fin/rudder and a belly-contour which will make it look a lot different. Here's how the wing and stab fit-into the slots cut for them in the fuse. It's sort-of a "teaser".. but not really. I like to "fit-up" these components as early as possible, to get some perspective on what I've drawn. The next phase will be designing the nose reinforcement/engine-mounting. There will be a landing-gear; in a tail-dragger configuration. The "mains" will be built-into the engine-mounting.. and will likely be an inverted-"V" design, made from 1/16" music-wire. Coming along nicely I like the curves you are using, did you say u were going to use a product engine with a ext. tank :? getback wrote: Coming along nicely I like the curves you are using, did you say u were going to use a product engine with a ext. tank :? Thank You Eric.. and "yes".. that's the plan. I'm working on a nose-design/engine-mount with a firewall to accept either the Cox .049 horseshoe backplate or a Bee-style (tanked) engine. The engine-mount will be at the wings' leading-edge.. but I have some simple ideas for adjusting the CG to accommodate varying engine-weight/length. I like it roddie. Following your build. I pre-build these parts for when inspiration strikes. Granted.. I often make extra parts during a build.. for possible use on a similar/successive one. 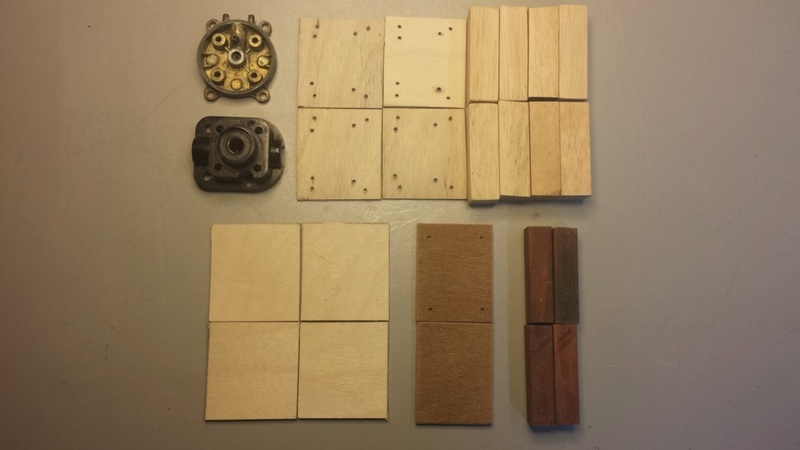 The square hardwood blocks are what accept wood-screws for mounting the engine. They run vertically behind the plywood firewall-plate assembly, either side of the fuse-stock at the nose. I will include ply-wood doublers running 1/2-way back into the wing-chord (2") both; for some extra strength.. and to also increase the fuse-width for the blocks to "square-up" with the ply-firewall plate-assy. rsv1cox wrote: I like it roddie. Following your build. Thank You Robert. I hope to have more photos of the progress, later this afternoon. I try to post photos whenever I can, which helps to keep interest.. as opposed to text.. where it can be hard to envision what's in my mind. I appreciate when you people take an interest in my efforts.